Given the title and the weather, which has not exactly been conducive to astronomy this summer, you might think this is a repeat, muchachos, a summertime rerun, a moldy oldie. The Astro Blog equivalent of The Beatles Again. Uh-uh, nosir. The Big Bang Theory might take the summer off, but not The Little Old Blog from Possum Swamp. I know it seems like I just talked about me and D’s last trip up I-65 to Huntsville, but believe it or no, that was almost a year ago, last Thanksgiving, and we've just been up there again. Time flies when you are having fun, or, like Unk, getting old. We for sure planned to visit the U.S. Space and Rocket Center on this trip, but that was only the second of two reasons we had for heading north. The first was the famous Huntsville Hamfest. If you are a ham, an amateur radio operator, I don’t have to tell you about the HH. If'n you ain’t? It’s become one of the biggest hamfests in our part of the country, and, in fact, in the whole country. "What’s a hamfest,” you ask? That’s easy: it is like a NEAF for amateur radio operators. Tons of dealers, countless flea market tables, and hundreds of nerds like your old Uncle running around like chickens with their heads off. Why should you care if you are not a ham? 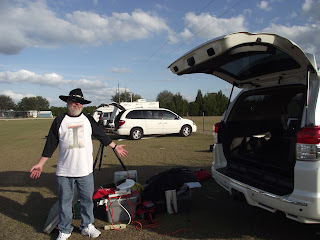 Because, as I have said before, amateur radio and amateur astronomy are a lot alike and there is always something of interest to amateur astronomers going on at a hamfest. Amateur astronomy and radio don’t just share the same people—despite the hordes, D. and I soon ran into a fellow PSAS member—the “sister” hobbies’ activities also have a lot in common. Hams are interested in the Sun, to include observing the Sun, due to Sol’s influence on radio propagation, but it goes beyond that. 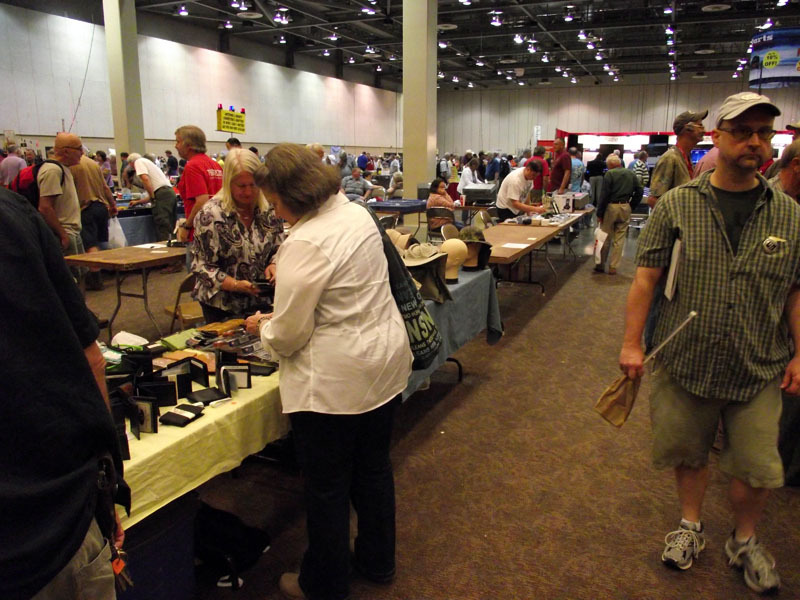 There is growing interest in radio astronomy, many of the people pursuing that are hams, and there is no better place to look for radio astronomy gear or information than at a hamfest. Udder than that? You can find just about anything under the sun on a hamfest flea market table, everything from cat toys to oscilloscopes and everything in between. I’ve even seen a CCD camera or two for sale at hamfests. Miss Dorothy, a non-ham wife, an “XYL” in our lingo, actually found more cool stuff to buy at the HH than I did. Course, before either one of us could buy a thing we had to get there. I have said it before, and I will say it again: the drive up I-65 from The Swamp to Montgomery is the most boring one in our part of the country. Nothing to see, nowhere to stop, precious few gas stations even. It’s a long three hours. 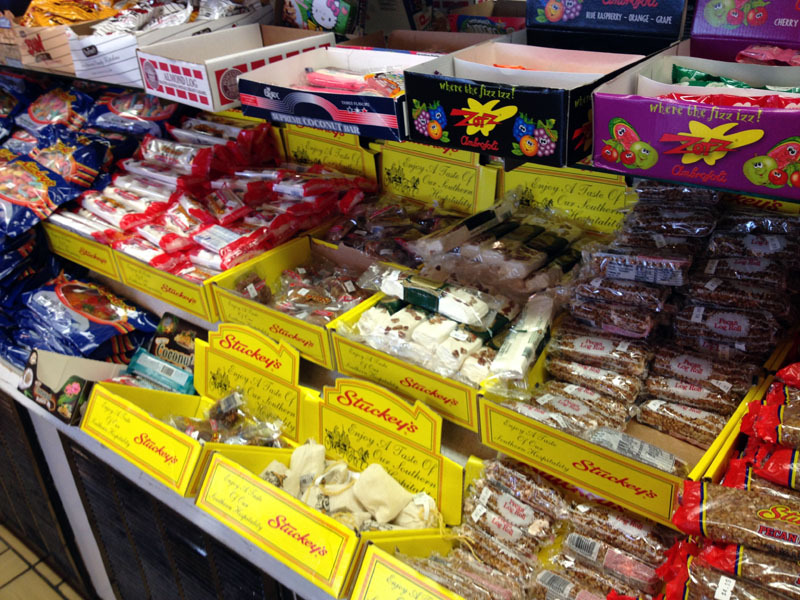 Luckily, when you get to Montgomery things improve, starting for us with our traditional stop at Stuckey’s. The place has been depressed for the last several years, but seems to be on the upswing again. At any rate, Unk got his time-honored chili cheese dog, was purty happy with it, and was soon in a better mood for tackling the second half of the journey. The only bummer remaining on the trip to Huntsville was getting through Birmingham, where there is plenty of traffic and the Interstate is in a constant state of (re)construction. We’d left at just the right time to beat the lunch traffic, though, and if we didn’t exactly sail through B’ham, we didn't get stopped in traffic, either. The last third of the journey is actually pleasant. The land begins to rise sharply from the Gulf’s coastal plains, and you begin to see small mountains, quite a treat for us flatlanders. Shortly after we left I-65 for I-565 and the final run into Huntsville, we spotted the facility of U.S. Tower, a manufacturer who sells antenna towers to hams (and everybody else). I thought that a good omen. 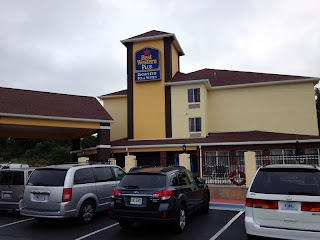 Over the last year or two, we’d been having as big a “motel problem” in Huntsville as we'd had in Chiefland for a while. For years, all through the 1990s, we stayed at the original Rocket City Holiday Inn, the one frequented by the giants of the Space Age in the 1960s. But the place began a precipitous decline at the turn of the century, closing its famous Orbit Lounge and transitioning to the downscale Holiday Inn Express chain. We tried an alternative or two before stumbling on a good motel near our favorite Huntsville Restaurant, Rosie’s Mexican Cantina. Seemed there was a new Best Western right behind the restaurant and in walking distance of it. We tried the new motel last Thanksgiving and were happy. This time, since the Hamfest was supposedly our numero uno activity, we’d planned to stay at the Embassy Suites, the event hotel. When all the hamfest-priced rooms filled up before we could get one, we settled on the nearby downtown Holiday Inn. The more I thought about that, though, the less wise it sounded. Almost all hamfests are two-day affairs, Saturday and Sunday, and like many hams, I find I can cover everything the first day. If we were not going to do Day Two, why pay for a downtown hotel? The Best Western would actually be closer to our fave restaurants and at least as close to the Space Center. We cancelled our Holiday Inn reservations and switched to Best Western. Checked in, D. and I were as pleased with the accommodations as we’d been last Thanksgiving: modern, clean rooms; big flat-screen TV; reasonable (cheap, actually) rates. After we were settled, it was getting on to suppertime, and that chilidog seemed like it was a long, long time ago. We’d had so much fun at the nearby Buffalo Wild Wings last year—that’s where we’d had our Thanksgiving dinner—we decided to try it again. Only slight irritant at the cotton-picking B-dubs? Seems as you can’t get a dozen wings anymore; you have to get fifteen. Unk loves them so much he was naturally tempted to eat ‘em all. Thank whatever gods there be that watch over silly hams, I had the sense not to try that. All them wings slathered with WILD sauce would have made for an uber restless night—at best—and I wanted to be bright-eyed and bushy tailed on hamfest Saturday morning. Once again, just like last year, Miss Dorothy’s drink order, a glass of pinot grigio, elicited a blank stare from the server, but after a little consultation he got it figured out. The night was a reasonably restful one after a little Rebel Yell to fill up the corners and a little cable TV. We were up in plenty of time to hit the free breakfast and head to the hamfest at 9:30. How was breakfast? One of the better motel ones I’ve had in a while: biscuits, gravy, sausage, eggs, pastries, fruit, cereal, waffles. After the previous evening’s wings-mania, Unk certainly didn't sample everything, sticking to the biscuits and gravy. Which was better than I expected, much better, and fortified me sufficiently for a long day of hamfest bargain hunting. The Huntsville Hamfest’s doors would open at nine, but I suggested we give it a little while to calm down. There would be a bunch of bargain-crazy hams crowding the entrance at nine, and since I didn't have anything special in mind to buy, I thought waiting for the mob to dissipate would be a good idea. The closest thing to doors-opening time at a hamfest? Trying to get into a Rolling Stones concert in 1969. 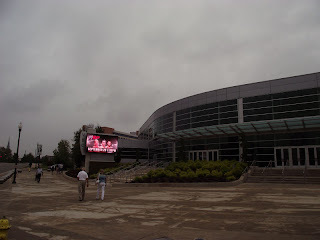 With the aid of our GPS, we made it to the Von Braun Center without incident in Unk’s 4Runner, Miss Van Pelt. Huntsville’s municipal auditorium complex, unlike the rotting one in Possum Swamp, is modern and well maintained. Miss D. had been there previously for a conference, but this was my first visit and I was impressed. Good thing amateur radio, unlike amateur astronomy, is mostly an indoor pursuit. 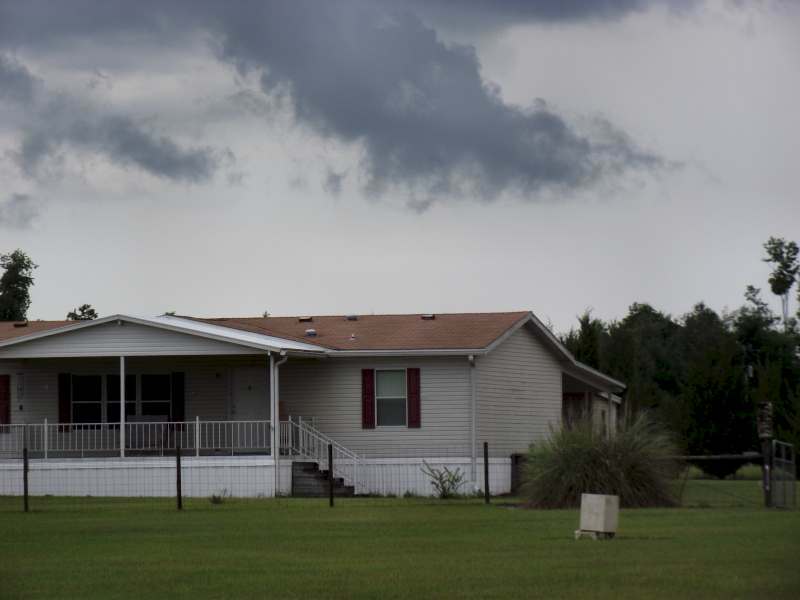 The weather was heading toward "nasty." It was drizzling rain and worse was on the way according to the local weather goobers.We followed the many hams walking toward the building, got inside, and paid our admission. I probably should have purchased additional raffle tickets, but just like at star parties I rarely—if ever—win anything at a hamfest. 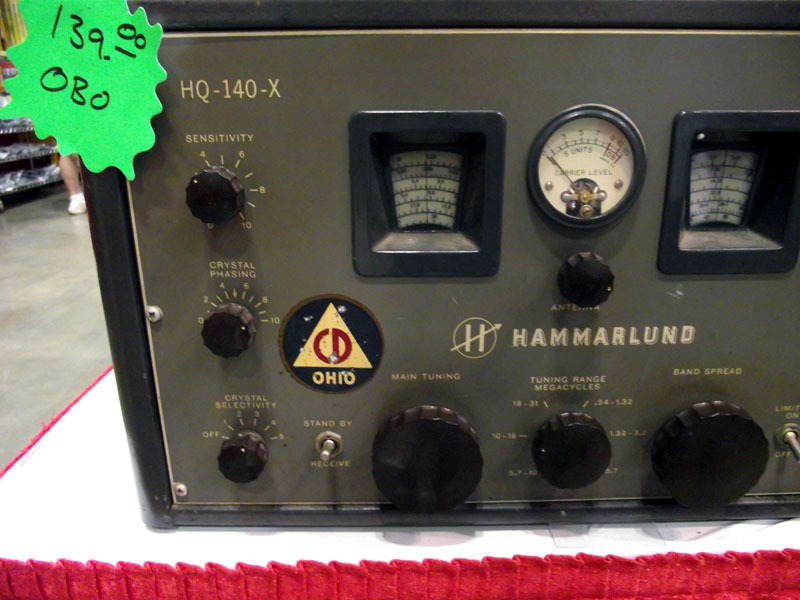 If you are used to small hometown affairs like Possum Swamp’s hamfest, a major event like Huntsville can send you into a state of shock at first. Unk hadn’t been to a bigun in a while, and when Miss Dorothy and I entered the arena, all I could do for a few minutes was stand there mumbling: “All this stuff…all these hams…all this stuff…all these hams.” That wore off, but I was still a little overwhelmed. There were more manufacturers’ booths at Huntsville than there were flea market tables at the last Possum Swamp Hamfest. The question for old Unk was “Where to start?” I noticed Huntsville dealer Gigaparts had a huge booth set up, and figgered that was it. I always try to patronize our local dealers, our in-state dealers at least, and Gigaparts is a good one. The last time I ordered something from them, an LDG antenna tuner, it was on my front porch faster than I thought possible despite their location in Alabama. I left D. to puzzle out the forum schedule and map of the arena floor and took a stroll through Gigaparts. What was there? A lot of everything, including a good, old Hammarlund receiver, an HQ-140-X that I could probably have had for a hundred bucks. It looked to be in good shape, and really brought back the memories. In the fall of 1957, The Old Man, Daddy, W4SLJ (now a Silent Key), used his prized Hammarlund Super Pro to let the neighbors listen to Sputnik’s scary beeping. I was awful tempted, y’all, but at this point I have sworn off what we hams call “boat anchors,” old, classic gear, no matter how much I love it and am sentimental about it. Hokay. No old stuff. How about new? Being purty much an “Icom Man” just like I am a “Celestron Man,” I headed for the big I’s booth. What was there? The absolutely bee-you-ti-ful IC-7800. Campers, this thing has at least a million knobs and buttons on it and a scrumptious full color display that includes a built-in panoramic adapter (“band scope” in today’s lingo). Alas, it has a price to go with all that coolness, just over ten fraking K. I spent most of my time admiring the IC-7600, which is almost as groovy and has an at least imaginable price tag for your stingy old Unk. 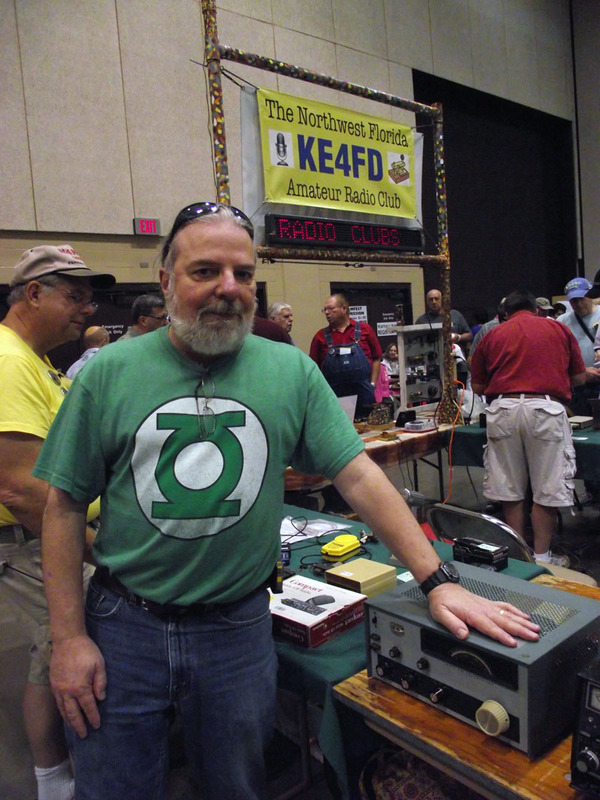 Despite my fondness for Icom, I gave the nearby Yaesu and Kenwood booths due attention, too. Let’s face it, all the big three make some mighty fine radios. Unfortunately or fortunately, Unk was not in the market for a new rig. I am more than happy with My IC-7200, which is kinda like the C8 of HF transceivers. Alrighty then, no big, beautiful HF rigs. My buying would be confined to the simple and inexpensive. I thought I’d like a new ballcap with my call on it, and I’d lost my last callsign badge, so I needed a new one. I also needed a wall-wart power supply to charge one of the jumpstart battery packs I use with the telescopes, something with enough current capacity to charge the battery a little quicker than the 800-mil job I’d been using. Finally, I thought I’d pick up a little Chinese 2-meter/430 HT. I have Baofeng’s UV5R handie-talkie and have been delighted with it, but I thought it might be cool to have their UV3R, too. 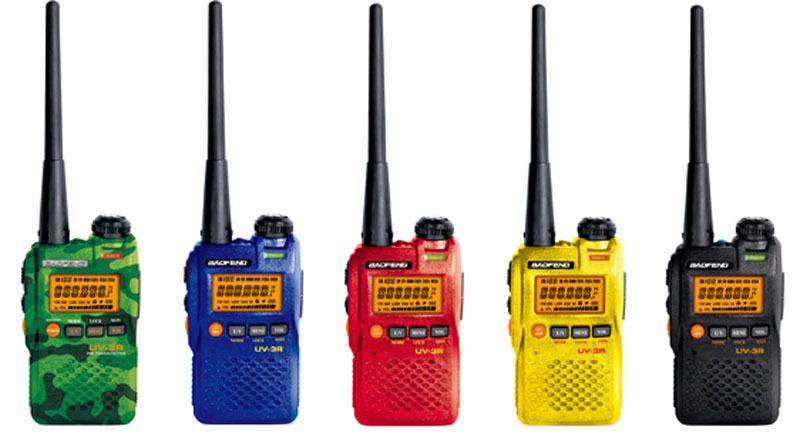 It’s even cheaper than the 5, about 40 bucks, really, really works, and for some reason I’d got my heart set on having a 2-meter radio in a fluorescent yellow case. You can get the UV3R in that color, in camouflage, and maybe even in hot pink for all I know. I don’t know if D. and I will ever get into homebrew SETI, but the presenter, William Dionne, N4DM, showed how you can do it, and do it in a pretty serious way for about 200-bucks. No, I didn’t forget a couple of zeroes. With a PC, an inexpensive low noise amp (LNA), one of them ubiquitous USB receiver dongles, a small homebrew antenna, a couple of filters, and a few other odds and ends you can be up and running in a fashion at least comparable to the Ohio State dish that picked up the famous Wow! Signal way back when. After the talk, it was time to get Miss D. initiated into a ham radio tradition, the legendary hamfest hamburger. I don’t know why it is, but whether venue folks or your fellow hams prepare the burgers, they always have that same special taste. One that reminds me of those happy times of me and The Old Man carting amazing finds like BC-610s and Model 15 teletypes and other stuff we didn't “need” to the car, wondering how the hell we’d explain more radio junk to Mama. Lunch was in the company of more friendly hams, and we had some FB eyeball QSOs, y’all. After lunch, it was time to get serious about the flea market. What did I see that I wanted badly? An HW-16 CW transceiver, which was my first rig back in 1969. That summer, the summer I got my first license, I imagined I’d get on the air with one of Daddy’s cast-off rigs, some pitiful little transmitter I homebrewed, or a beat up something I’d buy for a song from a local ham. That’s what I thought, till one afternoon in July when the doorbell interrupted my reading of a Doc Savage novel. It had been rung by the REA man (UPS before there was UPS), who was bearing a big box from Heathkit addressed to me. Yep, to little Rod, no mistake. In it was an HW-16 (kit), and it was flat-out wonderful. It was hardly cheap, $109.95, but the OM wanted to start me out right and he damned sure did. Once it was assembled—Daddy did most of the work but I at least helped—I got on the air, started working 15-meter DX, and never looked back. Yes, I was sorely tempted by that Hot Water Sixteen sitting right in front of me. I’d sold that first rig, just like I sold my first telescope, to finance the “better” and I regret it just as much. Maybe more, since the HW-16 was a dang sight better than my 3-inch Tasco reflector. I stood there considering for a long while, but finally gave into reality over sentiment. Even if it worked or I restored it, the little rig would just sit. I had Miss D. take a picture of me and the HW-16, and I moved on. There seemed to be miles of flea market tables, but we covered all of ‘em. What did Unk find? Well, I got a 1.3 amp wall wart for 5-bucks. I also glommed onto a new laser pointer, a violet one. I’m not sure whether it will have enough oomph to work well as a sky-pointer, but it might. While I saw a few UV5Rs, I didn’t see a single “3.” Shoulda scarfed one up at the Possum Swamp hamfest this past spring when I had the chance, I reckon. 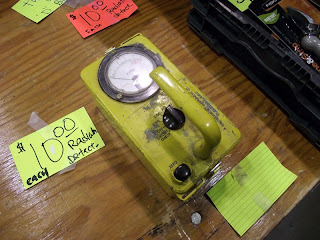 One last temptation: a dude was selling genuine 1960s Civil Defense radiation meters. And he was selling them in their original boxes with the CD logo, practically giving them away. Again, I (probably wisely) concluded that it would just be something else to gather dust at the Old Manse. Wouldn’t you know it, though? I changed my mind half-an-hour later. Alas, when went back they were all gone. Dadgummit. As Dorothy and I said our “73s” and finally headed for the entrance, late afternoon was coming on despite us having imagined we’d stay a mere two or three hours at most. That’s how it is with hamfests: mobs of your friendly fellow hams, tons of gear, lots and lots of fun, and you lose all track of time. 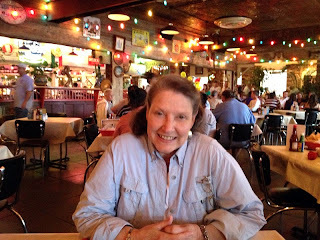 We rested up for a while back at the motel, but not for too long, and soon walked over to Rosie’s for a Mexican fiesta of goodness in the grand style. What’s to say about the place? 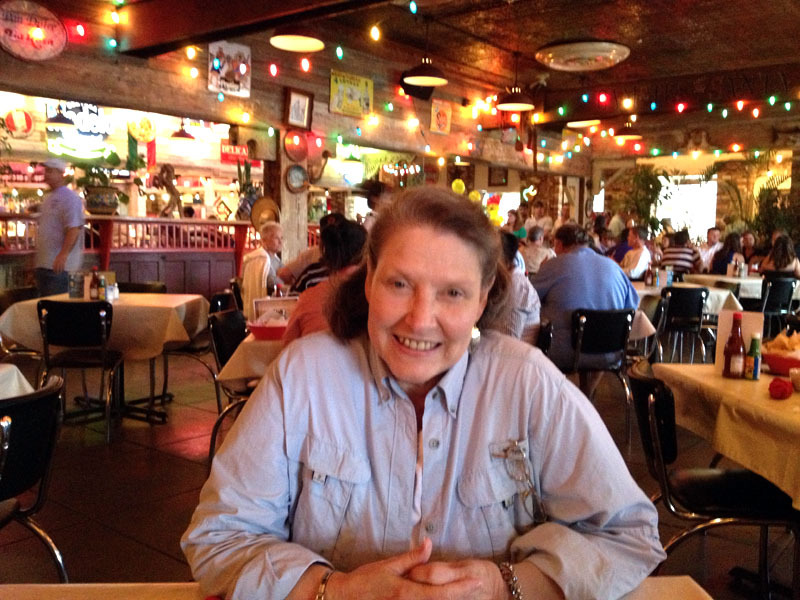 Rosie’s is big, staffed by friendly folks, and their Tex-Mex rocks. Unk, as usual, went for the shrimp fajitas. Only bad thing? I thought I’d rearrange my plate to make room for a great big draft Dos Equis on the table, and my fingers contacted the hot iron skillet the fajitas were sizzling in. Talk about a major league Owie. I was tempted to dip my poor digits in the cold beer, but was afraid Miss D. would think I’d been shanghaied into the execrable Deal with It reality (that’s what they call it) show. Supper was great despite my burned paddy-paw, and the rest of the evening was good, too, but I have to admit the motel bed was getting to me. I hated the pillows. From now on, I am taking my own with me on road trips. I simply cannot abide a pillow that is too soft in my increasingly curmudgeonly old age. 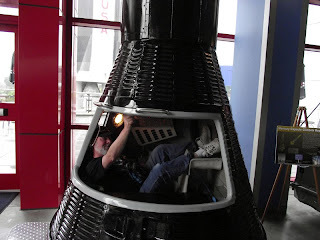 I was frankly relieved when Miss D. suggested we ditch our original plan, which was to do the Space and Rocket Center on Sunday and drive home Monday. Instead, we’d leave for the Swamp from the Center Sunday. Bad pillows aside, I would teach my first astronomy class of the semester Monday night, and driving home and going almost straight to the University didn't have a whole lot of appeal, y’all. Up early the next morning, another Best Western breakfast consumed, we were off to the Space Center, arriving there before nine, just before the doors opened. While waiting, we had a look at the Blackbird on static display out front. This SR-71—actually the A12 variant, its sign says—is in good shape and awful photogenic. After admiring the Blackbird, I moseyed over to the grave of the famous space monkey, Miss Baker, which is just outside the main entrance. I was touched to see someone had left a little offering, a banana, at her headstone. After we’d got in and picked our Imax movie, Hidden Universe, which would play at eleven, it was time to tour the exhibits. I told Miss D. that while the Space Center doesn't have as nearly much as the Smithsonian Air and Space Museum, which we’d just visited, they have plenty, and I don’t get to feeling overwhelmed like I did in DC. It hadn’t been long since we’d been to Huntsville, but they've been changing traveling exhibits and swapping out permanent displays frequently. The traveling show this time was “Black Holes: Space Warps and Time Twists.” Its interactive exhibits were fun for us and surely delighted the few kids we saw in the Center on this early Sunday morning at the end of summer right before the start of school. The black hole exhibit was nice, but what lit Unk’s fire was that the Center had gotten their hands on a brace of Apollo, Gemini, and Mercury simulators. Both ingress/egress simulators, and actual procedures trainers. 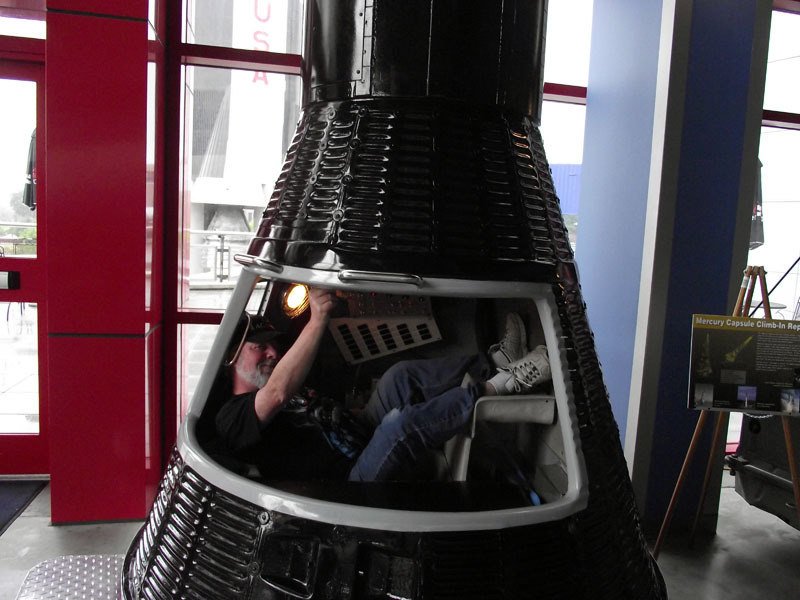 Unk managed to somehow squeeze his poor old bod into a Mercury capsule. It wasn’t easy, let me tell you. If the astronauts felt like spam in a cam, Unk was for sure ham in a can. After we’d covered every inch of the main building and the even bigger Davidson Center for Space Exploration (which houses a real Saturn V that has been beautifully restored), it was lunchtime. The cafeteria, which used to be called “The Lunch Pad” and is now known as “The Mars Grill,” was in its off-season sleepy mode, it appeared. The counter-folks at least verged on the disinterested, but Miss Dorothy was happy with her Solar Salad, and Unk was delighted with his Fourth Planet Combo (a cheeseburger with plenty of crispy B-A-C-O-N). Gotta admit, it put the hamfest hamburger to shame. Then came the finale, The Hidden Universe in the Imax. The film, which was mostly about the VLT down in the Atacama Desert, was spectacular. Dorothy just loved the sequences of the ESO’s big, beautiful telescopes Antu (Sun), Kueyen (Moon), Melipal (The Southern Cross), and Yepun (Venus). I’ve seen a lot of Imax films over the last twenty years and this was definitely one of the best. If you get the chance to see it you dern sure should. Quick run on the gift shop for a T-shirt for Unk and a little something for D., and that was that for our 2013 Huntsville expedition. I’d hoped to find some of the classic 1950s spacecraft model kit reissues the Center used to sell, but no dice this time. Despite that disappointment and the 6-hour drive back down I-65 that had to be faced, Unk was feeling good, real good. Big hamfest and the Rocket Center all in one weekend with Miss Dorothy at my side. It just don’t get better than that, muchachos. Nota Bene: You can see many more pictures from our trip on Unk’s Facebook page, in the “Albums” section of “Photos.” For (a little) more on my ham radio activities see my (AC4WY) page on QRZ.com. Blog News: The Little Old Blog from Possum Swamp is now on the air in Poland in Polish. Don’t believe it? See it rat-cheer. Yep, amateur astronomy sure does, muchachos. 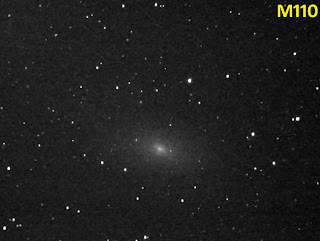 When it’s cloudy you can play with astronomy software and do image processing on the computer, tinker with your telescope, and read about our avocation, but in order to practice it you need clear skies unless radio astronomy happens to be your bag. Amateur astronomers do a lot of talking about the weather, but don’t do anything about it, to paraphrase Mr. Clemens. That’s still true, but not as true as it used to be. No, you can’t change the weather, not even if you have the HAARP array at your disposal, but at least you can have a better idea what it’s going to do than sprout Rod did back in the 60s. Back in them dark ages, it was brief and not very detailed forecasts in the newspaper, on the farm report on TV at 6 a.m., or on the local news at 5 p.m. Today, we have tons of weather data available all the time from the cotton picking Internet and from 24-hour weather cable channels. There are even computer programs and websites for astronomy-specific weather forecasts. You can either believe the weather forecasts these services will make for you, try to use the same data they do to make your own predictions, or you can do things the basic/old-fashioned way and observe the sky to come up with your own forecast. Given the fact that meteorology is still not an exact science, your weather predictions may be just as accurate as those fancy-schmantsy forecasts using satellites and a ton of expensive equipment. For your exact location, anyhow. Yeah, I know the weather channel ain’t quite what it used to be. The channel now runs reality shows, including one about truckers. Not that I have anything against the knights of the road, far from it, but reality shows don’t seem like a natural for a network supposedly intended to inform about weather. I fired off an email to them, but the response in so many words was a lame, “Hey! Truckers experience weather, and we’re the WEATHER Channel!” There’s also Al Roker’s hoo-haw in the morning, of course. But how does the weather you get on TWC stack up? It’s standard stuff: pretty girls (though not nearly as pretty as the ITV weather girls in the UK) and fancy touch-screen weather maps. It’s enough to give you an idea of what the weather will be for your general area without a lot of data and details. Where the TWC still shines is when there is a weather emergency like a hurricane. Their heavy hitter meteorologists do a bang up job, still, during those events. TWC’s long-running weather site on the WWW, Weather.com, is much the same as the cable channel these days: there’s enough information to give you an idea how the weather will be on any given evening, but you have to drill down for it, and what you get is summaries, not hard data. And by “hard data,” I don’t mean esoteric things like historical weather readings. Hell, I can’t even find my current barometric pressure on the site. I did run across a splashy “lifestyles” page that didn't have pea-turkey to do with weather far as I could tell. I do like the site’s map system, and particularly the “future” animation function, which will give you a graphic display for several hours in advance of the current time. If The Weather Channel’s website is kinda basic and ho-hum, their smart phone app (I have an iPhone, but I am purty sure it’s available for Android, too) is fracking outstanding. Open the (free) app and you get all the current data that’s missing on the web page. Even barometric pressure, for god’s sake. Click for an hourly forecast, a 36-hour, and a 10-day. It’s easy to set up multiple locations and have your fave observing site just a swipe away. There’s plenty more, too, including push notifications of severe weather. 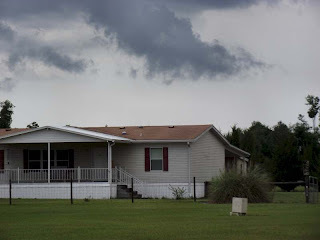 When Miss D. and I approached a bad storm on our way to Chiefland we got an alarm from the TWC app over our 4Runner’s Bluetooth audio system well before we got into the worst of the weather (How's that for a bad omen on an observing expedition?). The same excellent map system as on the web page has been squeezed into your phone, there’s video, and everything on the app is well designed and easily accessible. If you have just one weather app on your phone or tablet, TWC’s should probably be it. Wunderground has several things going for it if you are serious about weather. They give you much more data, raw data, than TWC. There’s even an astronomy section on the front page showing the times of civil, nautical, and astronomical twilight. Want more astronomy? A click takes you to an honest-to-god astro page with a tolerable star charting system (which appears to use the Distant Suns engine). What else? There’s a weather map that is probably the best available to the public. The Wundermap is not as pretty and glitzy as the TWC map, but it shows far more data. I still like the Weather Channel chart when I want a quick read on what the night will bring, but if that leaves me puzzled as to whether I ought to head to the dark site or not, I turn to the Wundermap. When it comes to apps for cell phones, TWC’s and Wunderground’s roles are reversed; the (free) Wunderground app just isn’t very well done. It doesn’t show much data, and is, frankly, not very informative. It does have a halfway decent map, but the one on the TWC app is better. Sadly, two thumbs down. 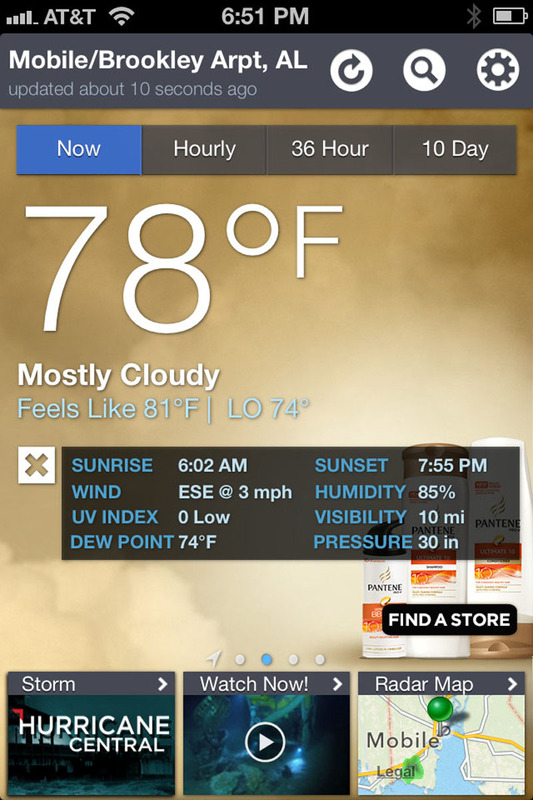 Howsomeever, Wunderground now has a second app: Weather Quickie. On the face of it, it is completely ridiculous, which is obvious as soon as you see the opening screen, a bunny-shaped cloud. The page that appears makes TWC’s web page look freaking data heavy. You have a couple of little weather symbols, and text that tells you whether it will be warmer or cooler tomorrow. There’s not even a display of current temperature. If that were all it did, there’d be no reason to fool with it, but it has a feature that makes it nearly as good as the TWC app. 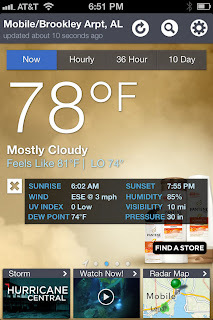 Click on the little umbrella (or Mr. Sun, or whatever), or the “get the complete forecast from Weather Underground” text and your screen will flip and you will be taken to the mobile version of the Wunderground web page for your current location, which is everything the mobile app is not. 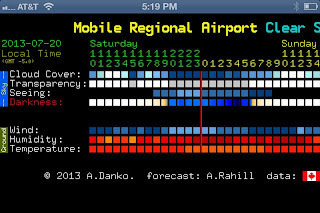 There is complete weather data formatted for your phone, including Moon phase, and a version of the Wundermap that is considerably better than what is in the app. Sure, you can go to the mobile version of the Wunderground web page with your phone’s browser, but I find it easier to get there by going through Quickie. And who knows? They might improve Weather Quickie some day, maybe even adding temperature to its display, you never know. To the right of each category is a line of little blocks: dark blue = “good,” white = “bad” with several color gradations in-between. The forecast range of CSC is 48-hours, which is usually plenty. How accurate? When talking “weather,” “accurate” is still a relative thing, and it’s possible to have white squares all down the line and have a great night. 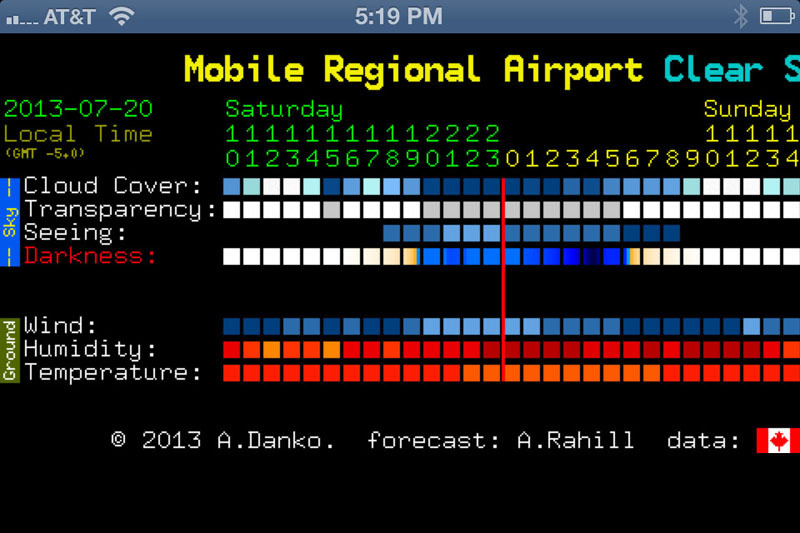 Still, used in combination with other weather data sources, CSC is purty reliable, just keep checking it for changes. Clear Sky Chart has been the preeminent astronomy-centered weather program for years now. That’s because it is very good, but it is also because it has not had much competition. The rise of smart phones and tablets is changing that with several astro-centric weather apps having appeared in the last year or two. Some, like an iPhone app called Scope Nights, have taken the ball and run with it, and are threatening to eclipse CSC for amateur astronomers. How good are these new ones? I will tell you about ‘em some day soon. How did li’l Unk get most of his weather data back in the mid-1960s? Usually with my prized 6-transistor radio. Actually, it was Mama’s radio, but she let me listen to it once in a while. Fact is, radio is still a convenient way for amateurs to find out what the weather will be. Especially since some of the places we observe from are bereft of cable TV and may not even have wi-fi Internet or cell phone coverage (horrors). You can still get weather on the AM and FM broadcast bands just like in The Old Days. There are some Weather Channel affiliate stations, but usually weather reports on the local country oldies stations (or whatever format you like) are sporadic and vary tremendously in quality. I still like to have an FM radio with me so I’ll have Miss Tammy Wynette to keep me company if I am observing alone, but broadcast radio ain’t a good way to get weather. What is? NOAA Weather Radio. NOAA has enough radio stations (at VHF frequencies around 162 MHz) that there are few areas where you can’t hear excellent forecasts “read” by their computer “announcers.” Only caveat? If you live in a coastal area, you will have to sit through extensive marine reports before you get to landlubber weather. So, how can you get NOAA Weather Radio? Walgreen’s, Walmart, and a bunch of other places sell weather alert radios. I like the ones from Midland, and especially their “alert” receiver. One of these may even save your life. Put one in your bedroom, put it in “standby,” and it will wake you with an alarm tone in the event of weather (or other) emergencies. You can get this receiver for 50-bucks or less, and that may be the best money you ever spent if you are in an area prone to tornadoes or hurricanes, or, like dadgum Possum Swamp, both. 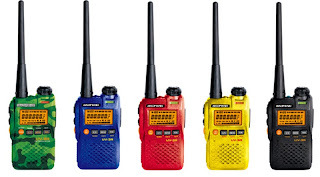 Being a ham, an amateur radio operator, I have a little VHF/UHF handy-talkie that, in addition to transmitting on the ham 2-meter and 70-cm bands, receives FM broadcast and NOAA weather radio. If you are a ham and have an older HT that doesn't get weather radio, you might consider upgrading. The little Chinese dual-band jobs like the Baofengs work great, can be had for considerably less than 100 bucks now, and can provide you with some ham radio fun if the clouds do come and there are repeaters in the area. At home, I have an inexpensive Yaesu FT-1900 2-meter rig in the shack that puts out almost 60-watts and will check the NOAA weather radio for alert tones periodically while scanning and let me know if something bad is about to happen. Being able to put together a detailed and accurate weather forecast requires not just high tech sensors, but years of training and experience. Just being able to make an educated guess about what the weather will do over the next few days requires weeks of training, like the military’s weather observer courses. Even so, by checking a few “indicators” you can get at least an idea of what’s going to happen over the next few hours or maybe even days. If the forecast you are getting from the professionals is for an area some distance from your exact location, your guesstimate may actually be more reliable for your site than NOAA’s predictions. The indicators that will give you a good idea of whether you will be in deep sky heaven or skunk city? Clouds and wind. Clouds are your primary means of predicting the weather without a forecast. Cloud layers moving in different directions are usually an indication of bad weather on the way. That old wives’ tale about “mares' tails” (cirrus clouds) and “mackerel scales” (altocumulus clouds) in advance of rain? As Linus Van Pelt once said, some of those old wives were pretty sharp. Have the desert storm scope cover ready to go if you see either. Bad weather will arrive within 36-hours. If you see both mare’s tails and mackerel scales at the same time? You will be wet soon, likely sooner than 24-hours. Also keep a sharp eye out for “towers” of cumulus clouds. Yes, patches of cumulus clouds are common on warm afternoons, but towering formations of them can indicate the possibility of severe weather. Need I say that if severe weather arrives you need to get yourself off the observing field and into a vehicle, at least, in a hurry? More or less in the cloud category are rings around the Moon and Sun caused by ice crystals in the upper atmosphere. An old saying I found when I was researching near-sky phenomena for a children’s science encyclopedia article I was writing was, “The Moon with a ring brings water in her beak.” If you see a ring around the Moon (or, less frequently, around the Sun), it will soon rain, I guar-ron-tee. Another old saw that also sometimes correctly forecasts rain? “Red sky at morning, sailor take warning, red sky at night, sailor’s delight.” Red sky at dawn means the red-light-scattering dust has been dispersed as dry air has moved through, and a low-pressure system carrying moisture is soon to arrive. Finally, what’s the wind doing? It’s usually a less accurate indicator of possible storms than clouds, but is still useful combined with your other “readings.” Easterly or southeasterly winds often mean wet stuff is headed your way. Not sure which way the wind is blowing? That old routine of somebody sticking their index finger in their mouth and holding it up actually works. The side of your finger toward the wind flow will feel decidedly cooler, no fooling. Whether it is NOAA, the local TV weather-goobers, or your finger doing the forecasting, as I’ve said a few times already, weather it is not an exact science. Don’t get your nose too far out of joint if despite an “all systems go, deep sky imaging till dawn” forecast you find yourself spending the night in a motel room with the cotton-picking cable TV and a bottle of Rebel Yell. That is just the nature of weather and the nature of our pursuit. The Cat's Out of the Bag Department: I believe video astronomy, imaging the deep sky with very sensitive video cameras, is about to break through to the larger world of amateur astronomy and may be The Next Big Thing. The problem heretofore has been cost. Up till now, you needed to invest at least 1500 bucks to really get off the ground in video. There were some cheaper cameras, but they all involved a lot of compromises. That's changing now with several new and relatively inexpensive cameras from Mallincam and a new outfit, Astro-Video Systems, hitting the street. These cameras, which are far more capable than the last generation of "novice cams," promise to not just make entry into deep sky video less painful, but to literally blow the roof off amateur astronomy. So far I've only had my hands on one of these, the new Mallincam Junior Pro. And it is a lulu. Great build quality, and I believe it is gonna be finer than split frog hair. I "believe" that, muchachos, but I can't say for sure, since the horrible weather we've had along the coast this summer has prevented me from doing anything with the Jr. Pro I am evaluating. As soon as that changes, you-all will hear all about it. When I began this blog eight years ago (on AOL’s long-gone blogger site), and especially after I transitioned it to a weekly schedule five years back, I was worried I might run out of stuff to write about. Obviously that ain’t never happened, muchachos. There is always something on my mind (such as it is) I want to share with y’all. Even when I am dealt a summer like this one that is so dadgummed cloudy and rainy I don’t get much observing done. Sitting in Chaos Manor South’s cozy kitchen the other night, listening to the rain and wishing I were somewhere under dark skies, I began reminiscing about The Herschel Project, my quest to see all of Sir William and Caroline’s deep sky objects, which I finished last summer. That led to me recalling one of y'all had asked about my “50 best” of the 2500 (give or take) Herschel objects. Luckily, I kept a running list of my faves, and even put ‘em in a SkyTools 3 observing list of their own. I fired up ST3 and had a look at said list. It ain’t quite 50, but near enough, 45 objects. I suppose I could have picked five more, but that would have been gilding the cotton-picking lily. These are the ones I thought were groovy-cool when I observed ‘em. What follows are my log entries for each one and additional words when called for. The aitches are in constellation order, and I’ve included Herschel numbers and NGC designations as well as alternate/common names as appropriate. I did a lot of the H-project objects with deep sky video cameras, my Stellacam 2 and Mallincam Xtreme, but for this one it was the 12-inch Dob, Old Betsy, visually with an 8mm Ethos eyepiece. What a spectacle this “boring” little galaxy was. 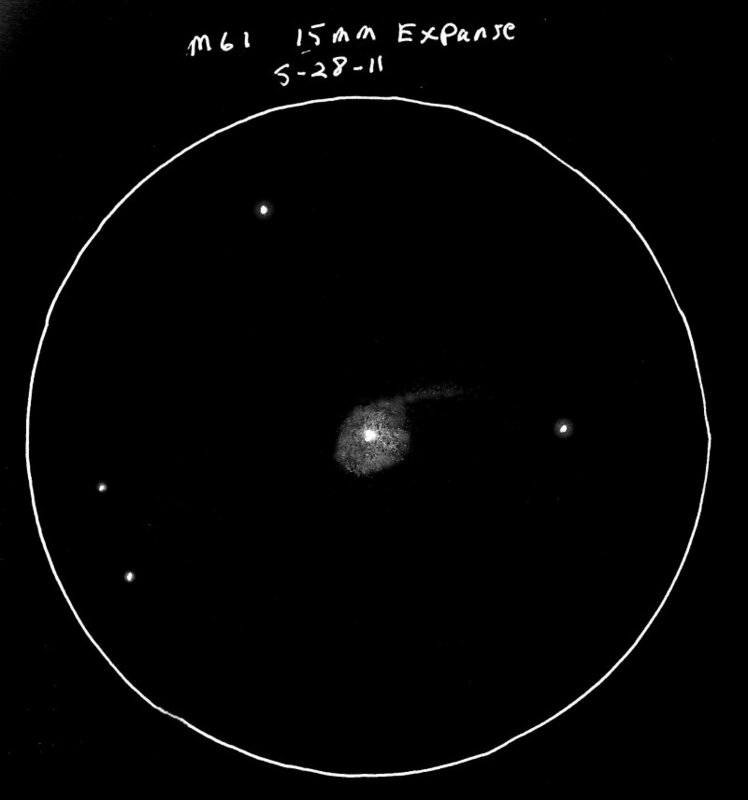 From the dark skies of the Chiefland Astronomy, I even imagined I glimpsed subtle interior detail in M110. 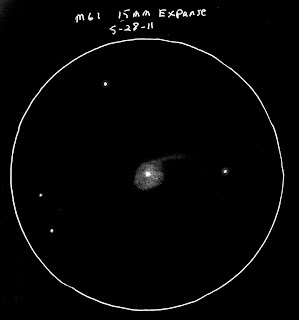 I’ve often struggled with this enormous elongated cloud on the western side of M31’s disk. 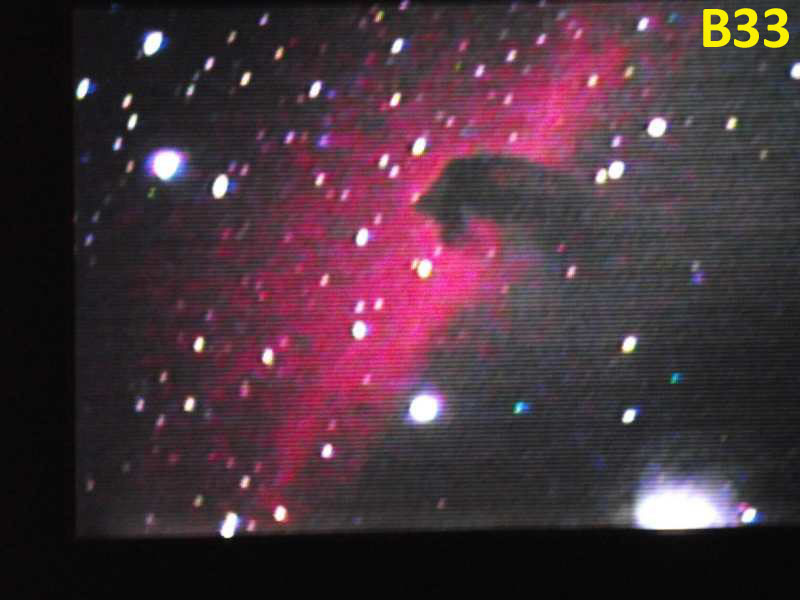 The best look I have had of it thus far was this one in October 2008 as I was on the cusp of beginning the H-Project and was playing around with the Herschel 400 at the Chiefland Star Party. I’ve seen the Saturn Nebula’s ring fairly well visually in my 12-inch Newtonian, and even better in my friend Carl Wright’s big StarStructure Dob, but it is really an object for video. On a steady night, I can image the round “fliers” on the ring tips. One thing I ran into constantly during the Project was fairly pedestrian galaxies that were made into true deep sky wonders due to the presence of other galaxies or groups of galaxies. The next time you are looking at M51, tear your eyes away and spend a few minutes with 5195. There is a surprising amount of detail in the little guy. What do I also remember about this observation? That I couldn’t for the life of me remember that NGC 4485 is called “the Cocoon.” I knew it was a famous one with a common name, though, and a little Googling gave the answer right quick. Imagine that, y'all, Internet on the observing field. 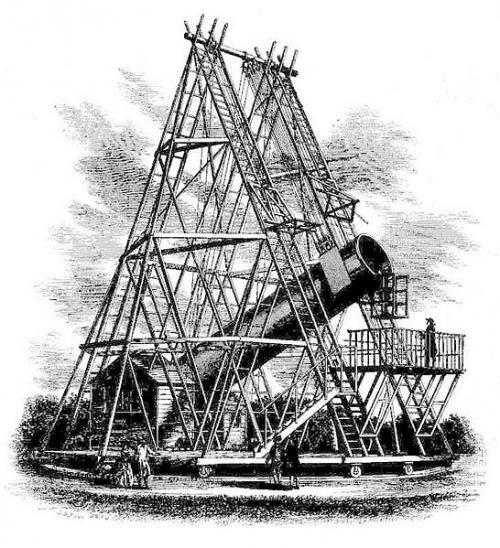 Ain’t modern amateur astronomy something? 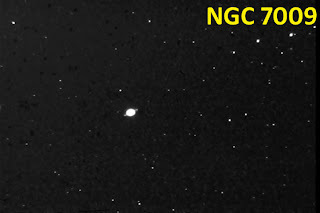 NGC 6120 was OK by itself, but the additional galaxies made this object a standout. What’s always interested me about this famous planetary nebula isn’t so much the legendary “blinking,” but the tantalizing hints of detail around its central star. 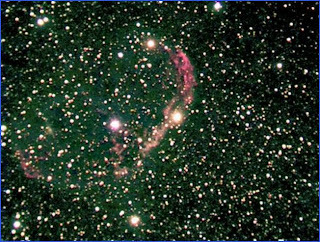 I’ve had some good looks at the Crescent Nebula, a long-time favorite object of mine, but this one at the 2009 Deep South Regional Star Gaze on the night before I began the Herschel Project was probably the best. If you’ve got at least a 12-inch telescope (or a camera) and a reasonably dark site, this may become one of your faves as well. 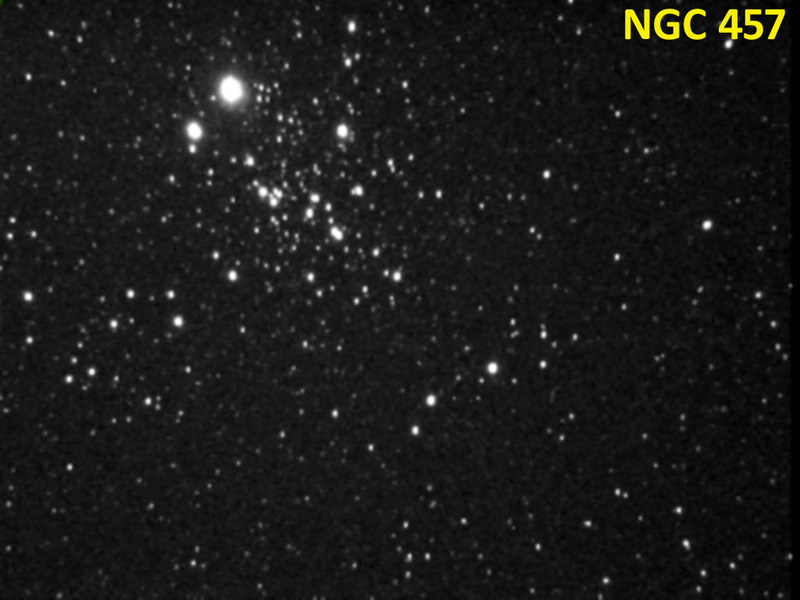 I believe NGC 1097 was my favorite among the hundreds and hundreds of galaxies I visited during The Project. 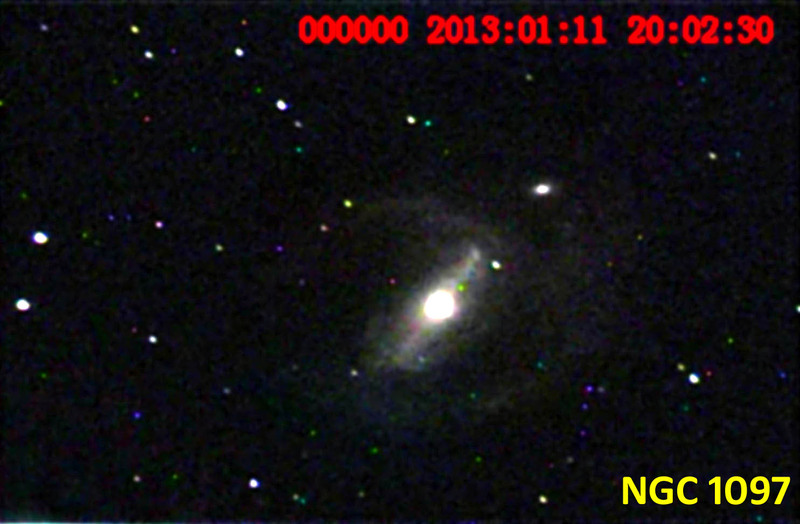 I’ll never forget the cool winter night in Chiefland when this monster of a galaxy burst onto my monitor. I got an even better look at it earlier this year when I was able to turn my color Mallincam Xtreme on it. I’ve loved M35’s small and distant pal ever since I got my first good look at it with Old Betsy from my backyard. This was a large, pretty object, but what was most excellent was seeing a good galaxy in Hercules, a place most of us don’t associate with island universes. It was cool to see a galaxy in a rich field where a cluster would look more at home, and the C11 and Stellacam 2 really did this one justice. I like all face-on spirals, but there’s something special about the little fellers. One of the unexpected beauties I ran across. Highly recommended. I love this trio of bright galaxies in Leo’s “tummy” region. 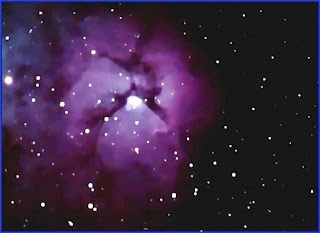 I searched for the Cone Nebula night after night with my 4-inch Newtonian way back when when I was a naïve little sprout. Naturally, I never saw a trace of that legendary object. It’s for big-dobs (barely) or a camera. The Christmas Tree Cluster is its own reward, however. Sir Willie may or may not have seen The Nasty Nag. Opinions vary, and his and Caroline’s notes are ambiguous. But I kept it on my Herschel 2500 list anyhow and was happy to have it there. Like most of y’all, I have a love-hate relationship with the Fickle Filly. She’s so easy and beautiful with a camera and so hard and lackluster with the eye. The only time I’ve seen B33 look like her pictures was one winter's night in Tom Clark’s 42-inch Dobsonian, the Beast. Even that massive scope could only deliver her horsiness with direct vision when seeing and transparency were just right. 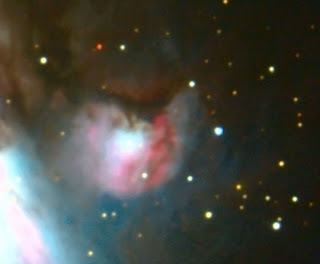 Certainly M20 is a fine object for a dark sky and 12-inches or more of aperture, but what really brings it out is a camera, especially a color camera, which will show the contrasting pink and blue nebulosity. M8 is a wonderful and legendary object, but it took me a while to appreciate it. 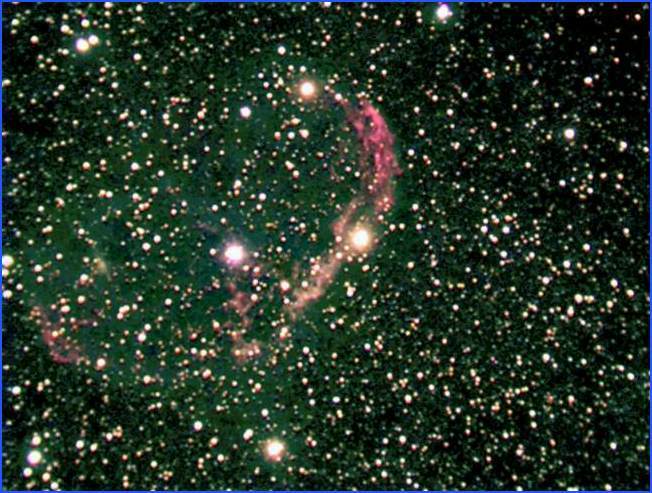 Visually, it’s best either in a small wide-field scope or with plenty of aperture. My 4 and 6-inch Newtonians didn't do much for it from Mama and Daddy’s backyard. 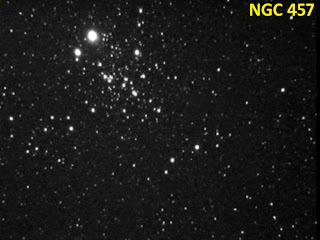 NGC 4088 (Ursa Major), a.k.a. ARP 18, is a weird looking mess of a galaxy. 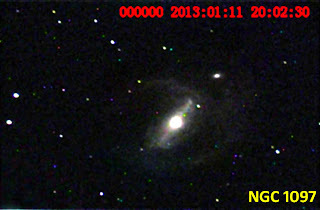 Something, maybe nearby NGC 4085, must have disturbed this magnitude 11.15, 5.8' x 2.2' Sc spiral. 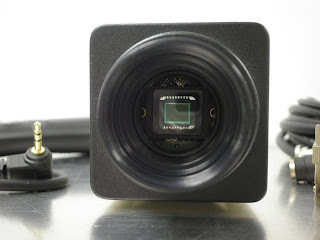 Onscreen with the C11 and Stellacam 2, its two odd arms give it a fork shape, like a trident. 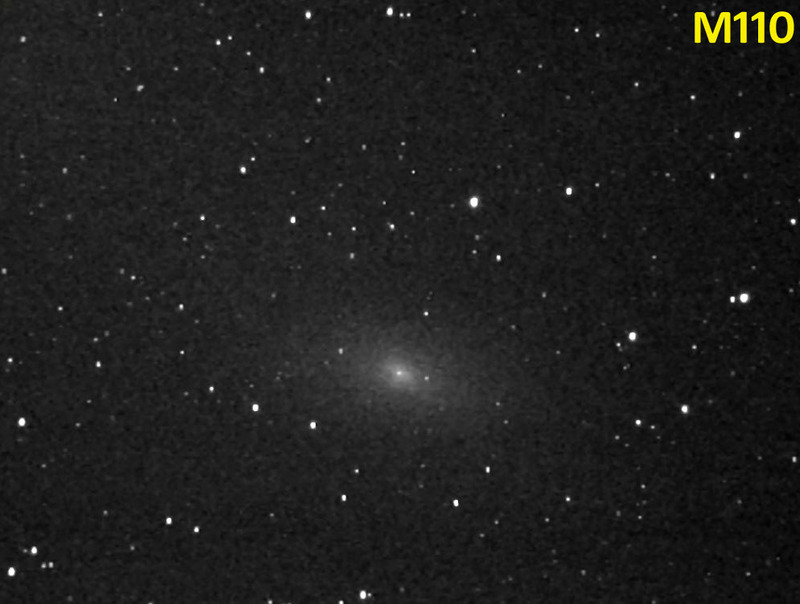 One patch of galaxy to the northeast seems detached from the disk. Until I visited Virgo for the Project, I don’t believe I knew the constellation had any globular clusters. 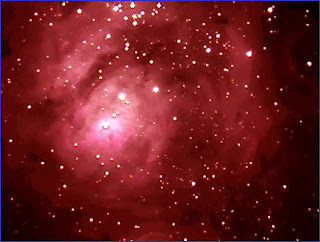 And that’s a purty good one to end on, muchachos, one of the top Messier galaxies, the good, old Sombrero. What is great about the Herschel is not just that it includes old friends like M104 and most of the top NGCs, but how many new friends you’ll make if you take on The Whole Big Thing. Resolve to travel William and Caroline’s starry road, and many, many exquisite but seldom-visited objects will become your new friends and boon companions.